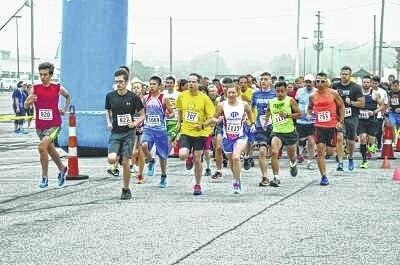 A 5-kilometer walk/run in Marion on Saturday will help benefit victims of domestic violence in Delaware County. The non-profit Turning Point, based in Marion, is the local domestic violence program for Crawford, Delaware, Marion, Morrow, Union and Wyandot counties, and operates a 24-hour hotline for victims of domestic violence. It is funded through the United Way, Delaware/Morrow Mental Health and Recovery Services Board, and other sources. The eighth annual Baguette Run — titled “A First Step Against Domestic Violence” — takes place at 8 a.m. Saturday at the Mallard Square Shopping Center, State Route 95, Marion. Registration begins at 7 a.m., and is also available online at www.columbusrunning.com or by calling 1-800-232-6505 or 740-382-8988. The entry fee is $25. Typically, there are 300 entrants. Cooperider said the 3.1-mile course starts and ends in the shopping center, and goes through the University Heights area. A runner herself, Cooperider has used her past experience in 5Ks and marathons to help put on a good event. After the race, Panera Bread will provide refreshments, awards and door prizes will be handed out, a raffle will take place, and there will be an obstacle course for kids and other kids activities. In addition, Panera Bread and Covelli Enterprises will present a $1,500 check to Turning Point from funds raised this year at the Marion and Sunbury cafes. The Marion Panera is next to the shopping center. This summer, Turning Point will close on a property in Delaware. Once that location opens, Cooperider said a similar running event could be possible in Delaware.